The thing that attracted me the most to this little sampler was the verse. Isn't it just absolutely beautiful and meaningful. I do hope God will allow us to stitch in heaven, don't you? I am so excited about the next project I am starting. It is a design that I have always loved. The picture on the chart doesn't do it justice at all I think, but when I saw the conversion at The Attic, I knew I had to stitch it..., It is the Kingsford Sampler by Carriage House Samplings. I am stitching it on 40ct Vintage Pecan Butter with The Attic conversion to Au Ver A Soie. So excited about this one. I'll show you a bit of progress as soon as I start. 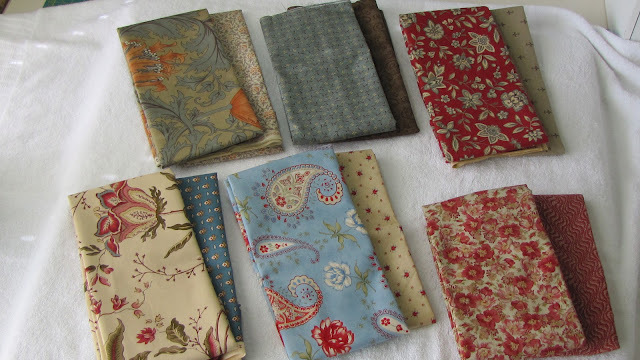 .... And these are some of the fabric combinations that I have bought to make into wallets. I have so many beautiful ones. The outside fabrics are the ones on the top and the inside fabrics are the ones underneath. I am looking forward to some free time to work on them!! Below are the latest fabrics from Blackbird Designs (I think they are the latest ones anyway, I've never seen them before). They are just so beautiful. I had to buy some extra fabric to make some wallets for me also !!! 1. If I were born again, I would be a violoncello player. I absolutely love the sound of the cello. 2. I have fulfilled my dream of swimming with dolphins. 3. I can't stand the smell of matches. 4. I played basketball competitively for many years..
5. I have hiked three mountains over 14,000 feet tall. Well, this is one very long post, but it is mostly pictures. Sorry if I bored you to death. I hope to be back again soon. Thanks so much for stopping by and leaving a comment. I really appreciate them !! Congratulations! Your sampler is wonderful and I DO love the verse. I had never seen it before. What a gorgeous finish, Natalia! Looking forward to seeing your progress on the CHS piece. Love the new stitch wallets as well as the fabric pairings for future ones. Your sampler is lovely. Great fabrics too. Oh my gosh, I want more of your wallets. So many pretty fabrics!!! Wow! I love your finish -- so pretty! And your next project -- did you have to say that about the Attic having a conversion for it? Sigh. I want to stitch it too!!!!! OMG! 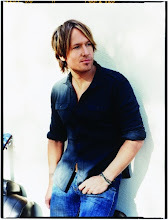 Gorgeous! Such a great post, Natalia. Yummy! Congrats on your finish... it's such a sweet sampler. Love the new project you've picked and it's going to look wonderful with those lovely silks. I'm sending you an e-mail about a stitch wallet... they're all wonderful. Your sampler is beautiful! I believe there will be stitching in heaven! Your fabrics are beautiful--love the blackbird fabric. Congratulations on your finish! It's gorgeous and I just love the verse too! Can't wait to see the start on the new project and it looks like you've got some great new project bags in queue! I love your finish. I might have to get that chart! I never noticed the little A&E in the corner! All the fabrics you've picked out for your wallets are wonderful! Congrats on the finish and I am anxious to watch your progress on the new project. I love the stitch wallets, especially the one at the top. What is the size and cost? Love this post! And thank you so much for the award!! I will get busy on that over the next few days! Love the finish! Love the new CHS with the conversion! I have never seen that chart before. Very different and totally cool! And the stitching wallets and new fabric combinations are making my heart beat fast!!! Is Wallet #11 still available?? If so I love it and want it!! The one with the little paper doll dresses and the darling lining fabric. I am having spasms over here about it!!!!!!!!!! Let me know and I will put a check in the mail! Great finish! I love the verse , as well. Look forward to your next start. Great new finish, and new project! Love all your wallets, the fabrics are so beautiful. Your latest finish is lovely and I'm looking forward to seeing your progress on the new start, the silk look so yummy. I've just received the chart for 'Spanish Mystery Sampler' after being inspired by your beautiful finish. I love your finish! The verse is wonderful. Your next start is going to be wonderful. I love this design, I wish she was still designing. Your fabrics and wallets are wonderful. Gorgeous finish!!!! And I am trying very hard to resist one of those fabric combos :-). We'll see how I do!!! The more wallets I have the more projects I can kit, LOL. Love your PSS finish - it's gorgeous! And what a great choice for your next WIP. Your wallets are lovely! Your stitching is just lovely & the wallets - Well - what can i say - Just perfect !!!!! Beautiful finish, Natalia! I can't wait to see your new start! Those thread colors are so pretty!! Beautiful finish! Love the colors for your next project and those fabrics ~ love them all!! What a beautiful finish!! Gotta love PSS! ! Lol!! Love all of your beautiful wallets, too. I love your sampler, it is so meaningful. I hope to stitch this one day for my home. Natalia, your My Handworke is gorgeous! I've always loved that design. Can't wait to see your work on Kingsford Sampler. The AVAS threads are gorgeous with the linen. Hi Natalia, just visited your blog for the first time! What lovely stitching! Everytime I visit the CHS website, I pause to admire and ponder "Kingsford Sampler". I've never seen it stitched so I can't wait to follow your progress! And, yes, I too love the sentiment on "My Handworke". It's a lovely thought that we can have a little corner in heaven for a weekly "stitch in"! What a great finish and your new project will certainly be fantastic. Wow all of those great stitch wallets!!! Natalia, your sampler is gorgeous, and I love the verse too. Your new needlework project and silks are beautiful. 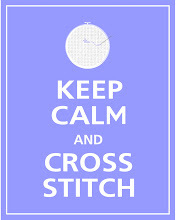 No wonder that you are so excited to begin stitching it! Your stitching wallets are so wonderful! I would love to have one or two or three! I will email you about my selection. Blessings! Unas labores maravillosas. PSS tiene unos patrones preciosos y este te ha quedado muy bien! !